Pass: (v) to go away, die, to go from one state to another. August 29, 2005 at 10:00 am Pass Christian, a community on the Mississippi gulf coast, lost all but 500 of its 8000 homes when Katrina’s storm surge topped the high water mark at over 30 feet and drove destruction more than half a mile inland. A once thriving community lay in ruins. Gone are homes, possessions, and the community. Many residents will not return but their memories are still in the essence of this place. Swimming pools are filled with grasses, blackberry vines creep over bleached foundations and peeling linoleum; nature, like a shroud, slowly covers Pass. Five years later, I shot Pass over the course of four seasons. I created my images with a medium format pinhole camera using wet plate collodion plates, a process from the time of the city’s founding. 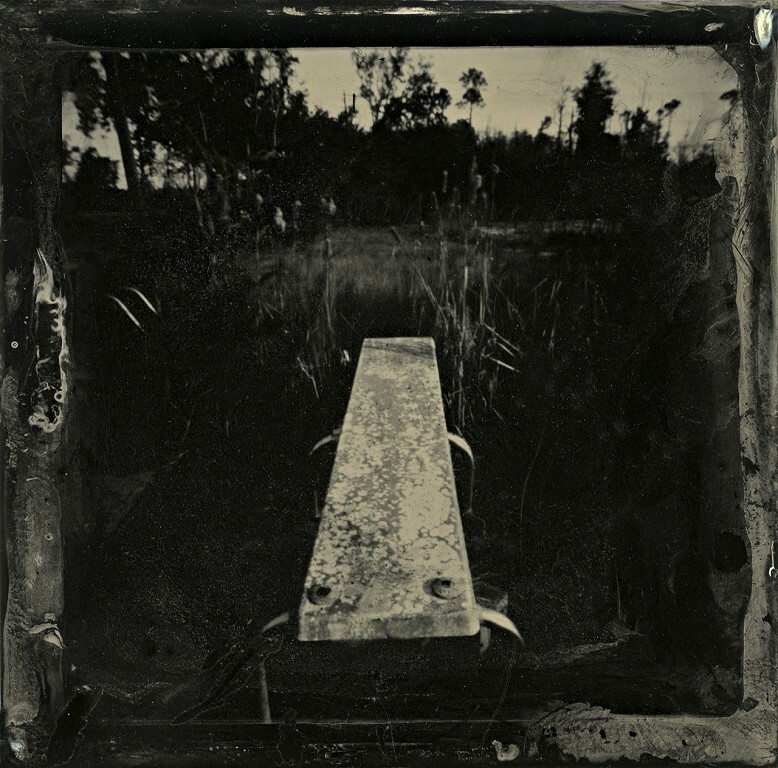 Wet plate captures mystery the way dreams reveal what daylight hides. I recorded the ruins that were once Pass. 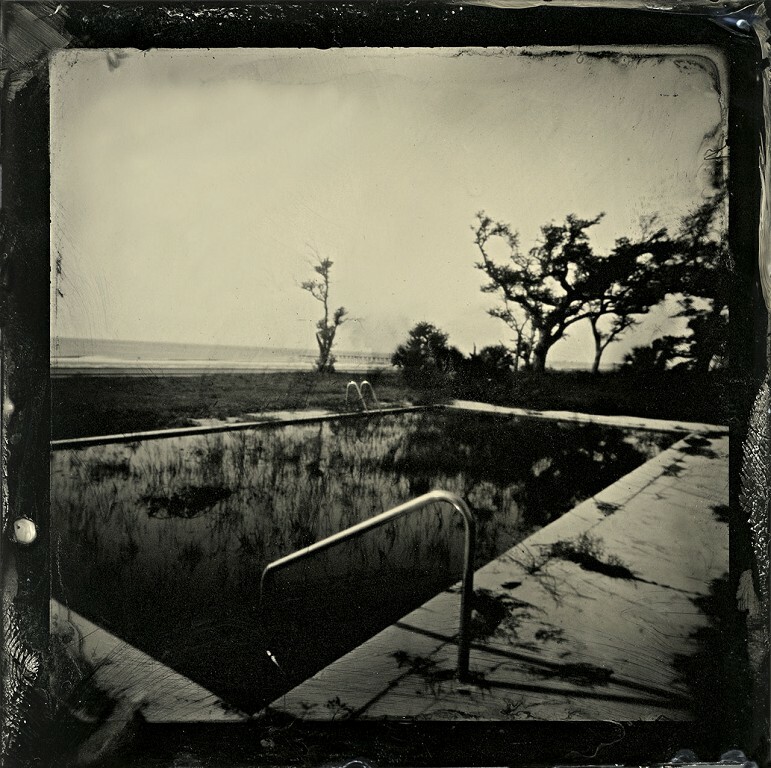 Wet plate is hands-on and I am a hands-on person. It is slow and fast, you flow the plate and sensitize, then you have about 10-15 minutes to get your exposure before the plate starts to dry. You develop, fix and wash. After you dry it over an oil lamp you varnish it with gum sandarac and lavender oil and everything smells like lavender. Happy accidents occur on the plates, mystery, sense of chance, I like the flaws. It is like spirits are coming out and speaking through me. When I flow a plate, there is a dark placid pool that draws me in and takes over, I like that place. Low Tech showed at the Center for Fine Art Photography during the month of October.